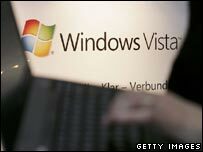 Online retailer Amazon has begun taking orders for Microsoft's long-delayed new operating system, Windows Vista. The US branch of Amazon is offering a number of different full-price versions of Vista, as well as upgrades from the widely-used current system, Windows XP. Windows Vista Home Basic is listed at $199 (£106), while the home/office version, Vista Ultimate, is priced at $399 (£210). Upgrades will cost less. Microsoft has said that business releases of the operating system should be available from November. The company would not confirm Amazon's pricing structure for Vista, but a spokesman for the retailer insisted that the pricing of Vista was "the one thing we are certain of". According to Amazon, PC users hoping to get their hands on Vista will be asked to pay prices similar to current rates for Windows XP. An entry-level upgrade package for current XP users to install Vista Home Basic on their machines will set users back just $99.95 (£53), with a full-release version of that system costing twice the price. A more advanced, media-rich version, known as Windows Vista Premium is also listed in the Amazon directory. Microsoft is reportedly keen to push this version of the operating system, due to include integrated TV and other media functions currently available only through third-party add-ons or as part of the Windows XP Media Center. The so-called Ultimate version of Vista, priced at $399 for the full version or $259 (£136) for an upgrade, is aimed at home users who wish to combine business capability with home entertainment features. A licensed version of Vista Business will cost $299 (£157) at Amazon, with an upgrade version retailing at $199 (£106). Vista is the first major update since Windows XP was introduced five years ago, and was originally due for release in the second half of 2006. But in March of this year release was postponed until 2007, and in June Microsoft chairman Bill Gates predicted there was only an "80% chance" it would be shipped on time. The company insists that any late discovery of flaws or bugs in the system will prevent a quick release.